2-8-0 1236 at Kansas City, Missouri on June 2, 1948 (Charlie Winters). This entry was posted in DW Collection, Steam and tagged 1236, 2-8-0, Baldwin Locomotive Works. Bookmark the permalink. 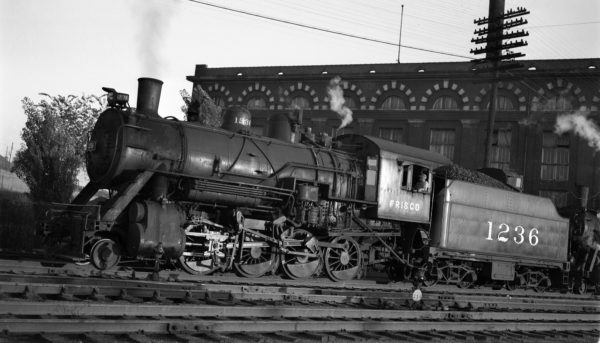 The 1236 is a 19th Street Yard Switch engine, which has been sent to KCUS to retrieve an in-bound passenger train so that the locomotive and passenger cars can be cleaned and serviced. Based a just the glimpse that we have of the locomotive that is behind the 1236, it is likely that 1236 is taking number 20 to the yards. After a closer look, the trailing locomotive has a front-end throttle, and thus is one of the 182-class 4-4-0’s….indeed train number 20.